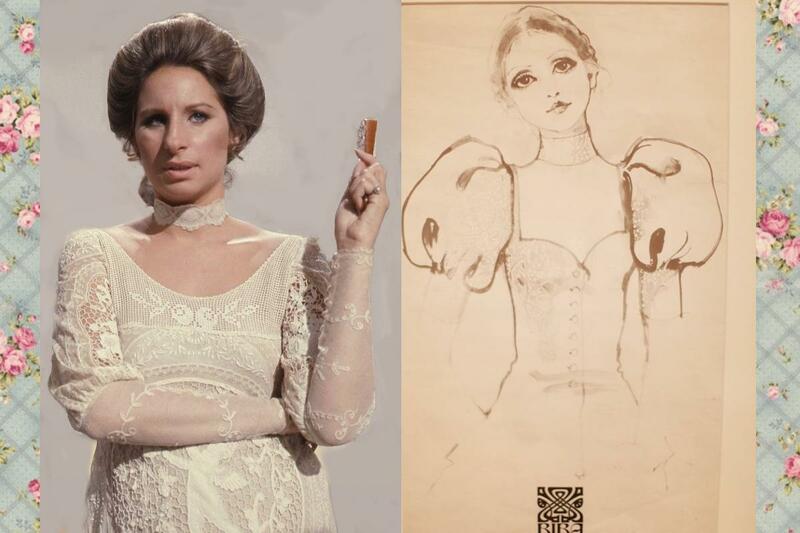 I noticed that some sixties posters and film costumes have a strong Art Nouveau and Pre-Raphaelite vibe, so naturally I turned to my art, culture and music bible when it comes to the Swinging Sixties – book ‘Syd Barrett and Pink Floyd: Dark Globe’ by Julian Palacios, And here’s what I found. 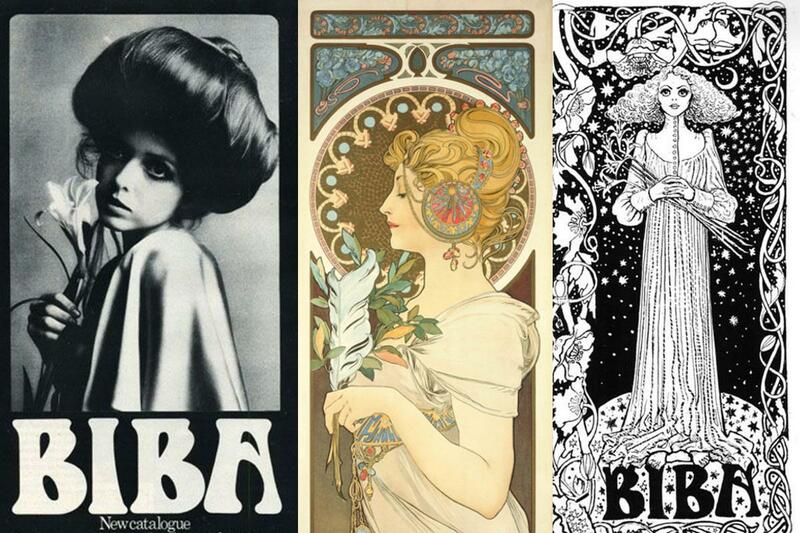 So, in this post we’ll take a look at the influence of Art Nouveau, Aesthetic movement and 19th century Orientalism on 1960s posters, designs, fashion and film costumes. I’ve also chosen some whimsical psychedelic tunes that I love and that fit very well with the mood of the post. Psychedelic Autumn, is it not?! 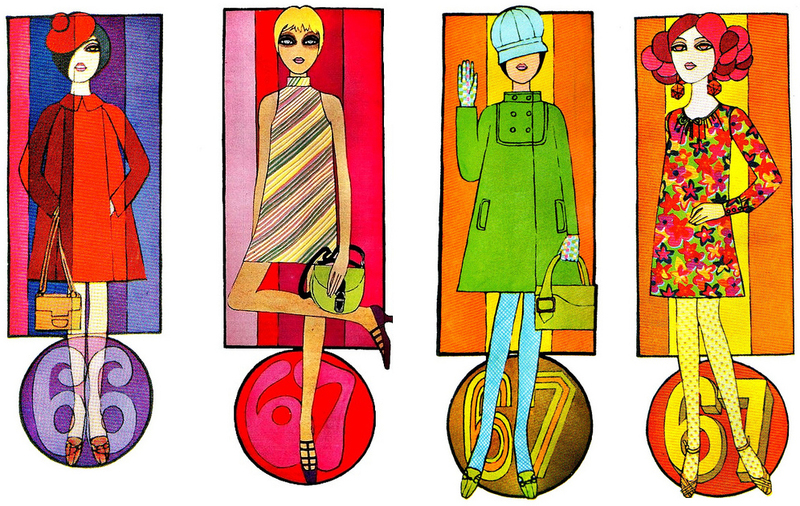 Around 1966/67 there was a shift in style and mood. A change was in the air, as ‘vibrant coloured clothes and laughter’ filled the drab tube stations. 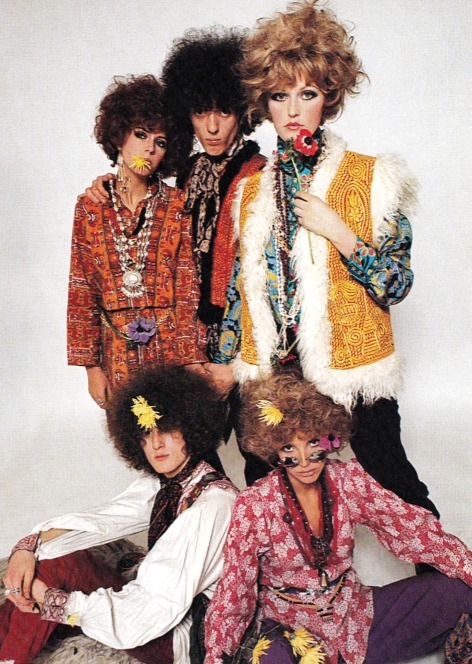 Waning Mod fashion was quickly being replaced by a style more romantic and oriental. The new mood, exhibited not only in clothes but in posters, designs and music, found its inspiration in nostalgic reveries of the past and romantic daydreams about far East. Gone were the days of short skirts and fake eyelashes. Instead, young people – students, artists, musicians, groupies and dollies – traded their black and white geometrical outfits for caftans, vibrant coloured long dresses, long hair and less make up. 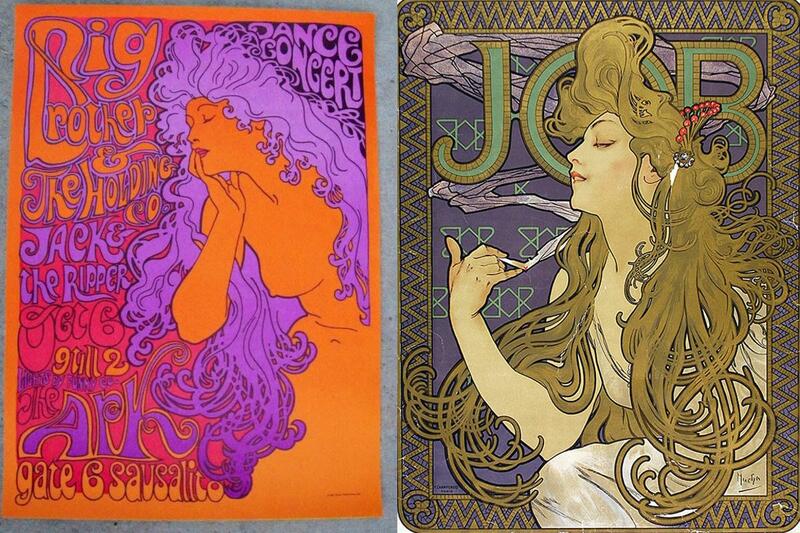 Do you notice the similarity in colours and composition between the sixties illustration (above) and Mucha’s painting ‘The Precious Stones (Ruby, Amethyst, Emerald, Topaz) from 1900. In late sixties, when Mod culture was starting to be looked upon as too commercial, and ‘futuristic themes gave way to exoticism, romanticism and nostalgia’ (1), young people started seeking answers and inspiration in paganism, mysticism and Eastern stuff: I Ching, Bhagavad Gita, The Golden Bough by James George Frazer which explores ‘magic, myths, Druids and Viking lore’, (p. 91), Ouija boards, tarot cards, meditation, vegetarianism and Hindu scriptures. Driven by LSD and hashish, they believed they were creating a new world, and so they delved into mysticism, found beauty in forgotten illustrations and paintings, whether it’s the sumptuous Klimt’s golden paintings or intricate William Morris wallpapers or William Blake’s drawings, laden with spirituality, hidden meanings and symbolism. 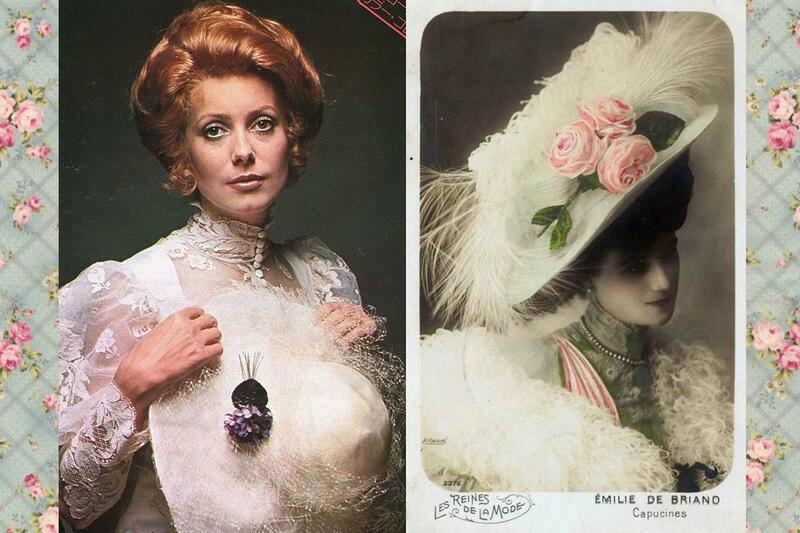 1) Baby Doll Cosmetics 1968/ 2) Photo of Cleo de Merode, 1905; similar hairstyles. Just imagine that beautiful asceticism of the sixties; candle lit room with bare floor, mattress, incense sticks, Eastern fabrics for curtains, someone jamming on the guitar, girls in colourful clothes with flowers in their hair, resembling Mucha’s painting, laughter, optimism, mind expanding chatter… General mood of the time could be described as a combination of idealism, hedonism and optimism that eventually exceeded into decadence. 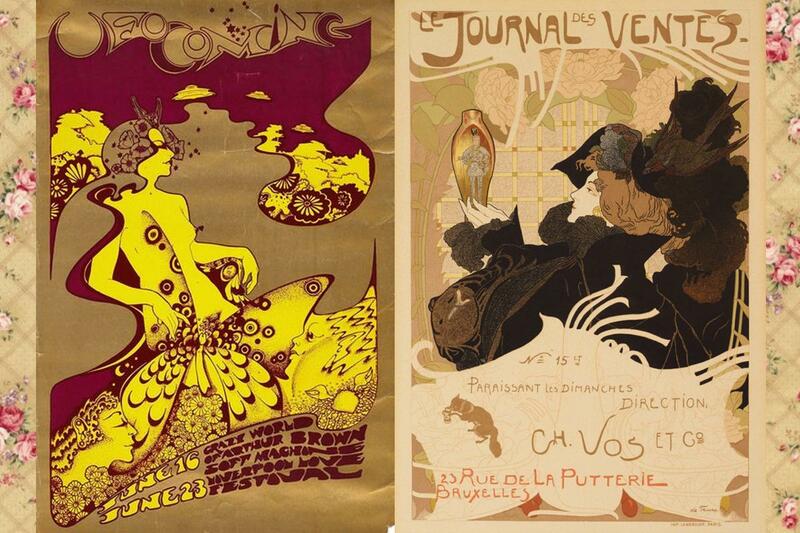 Similar were the turn of the century vibes and the art movement that came to define the era – Art Nouveau. 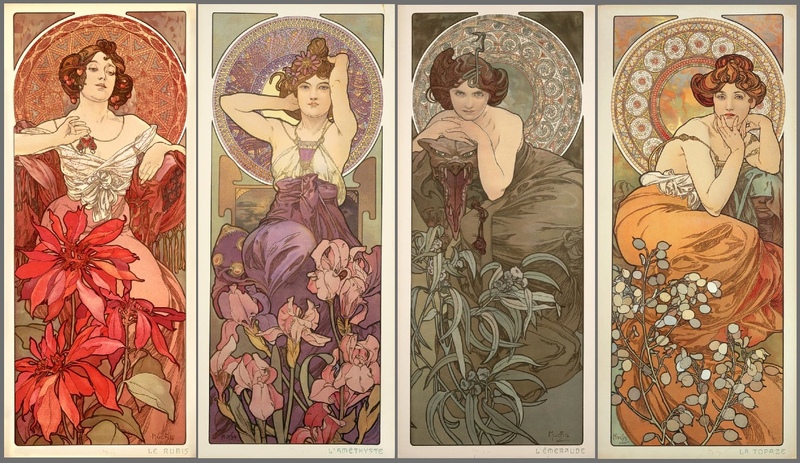 Art Nouveau demanded artistic freedom, art for art’s sake. Free the colour, the line, the beauty itself, the artists demanded. Similarly, in the sixties, after the drab post-war years were finally over and the economic situation was a bit better, artists and designers demanded the liberty of colour and design. 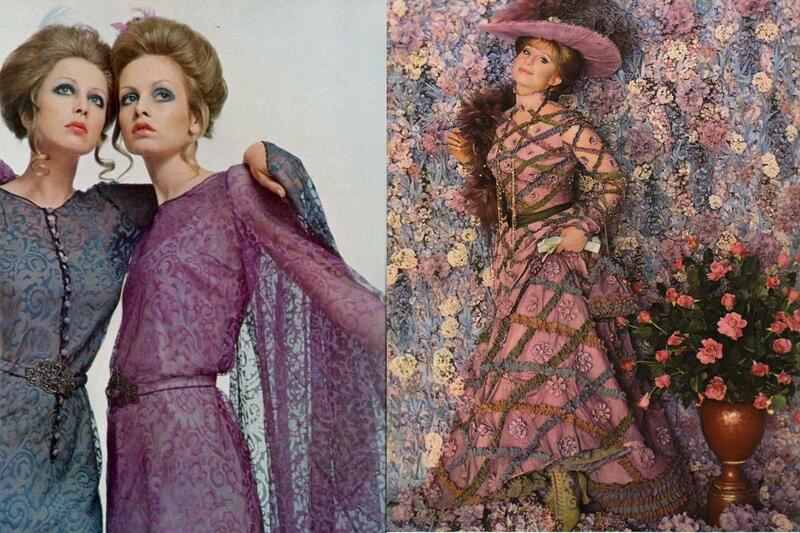 Taking inspiration from the past, in a hope for a better artistic future, designers combined the refinement and elegance of Victorian and Edwardian art; floral prints, aestheticism and playful lines, and combined it with acid-laced colours such as magenta, aqua and bright yellow. Inspiration was often found in flamboyant turn of the century designs by Klimt, Aubrey Beardsley, Mucha and Georges de Feure. 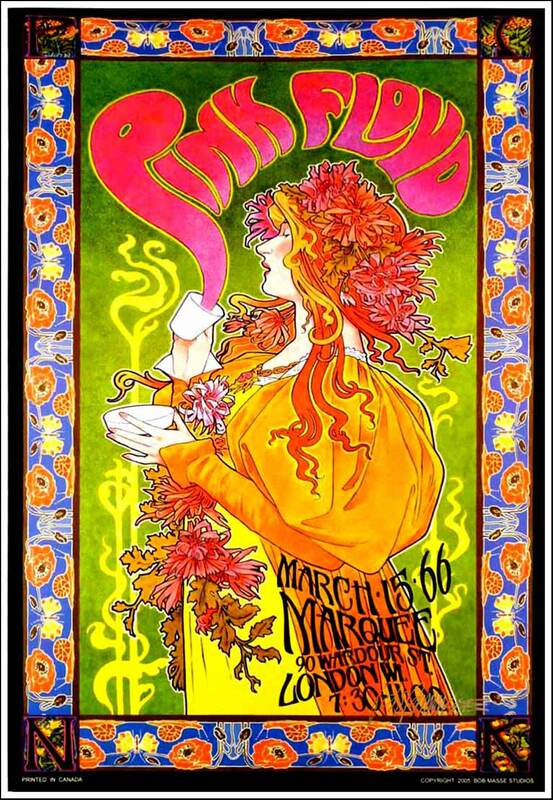 As you can see above, poster for the UFO designed by Michael English and Nigel Waymouth who worked under the moniker ‘Hapshash and the Coloured Coat’, is truly Art Nouveau in style; whimsical lines, fluid shapes amalgamating one into another, female figure with flowers and different ornamental detailing in her hair and on her body, the whole mood very playful and fit for the new sixties spirit and yet beautiful aesthetically. A sixties touch in designs is definitely colour which is often bright, contrasting and eye-catching, whereas the turn of the century style preferred more refined colouring, jewel-like colours being popular but always combined with subtler shades. Klimt, Mucha and Georges de Feure placed the attention on ornamentation, almost Baroque in its heaviness, whereas in the sixties, the designs were made for the tuned-in folk, and colour combination such as mauve and yellow, orange and lilac, red and green appealed to the crowd. 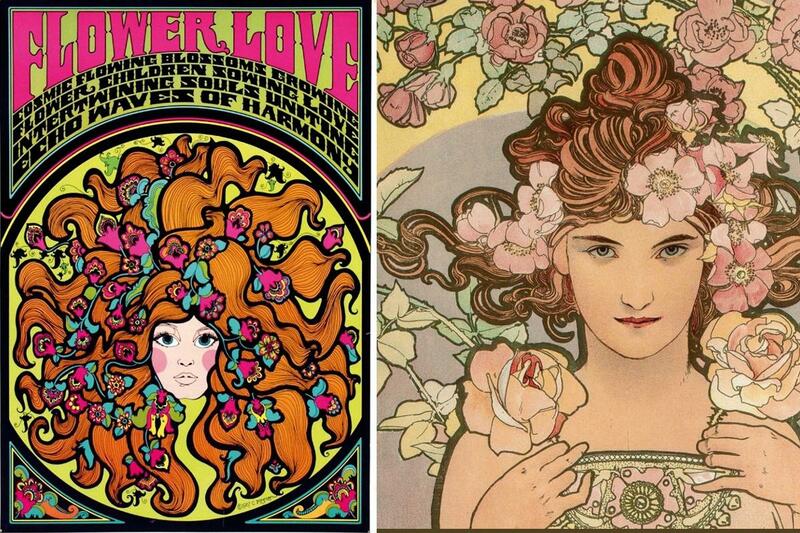 Psychedelic flamboyancy owes it all to Art Nouveau (and LSD). And it seems to me that the sixties were one really long Mad Hatter’s tea party with great clothes, music and attitudes towards life and spirituality. 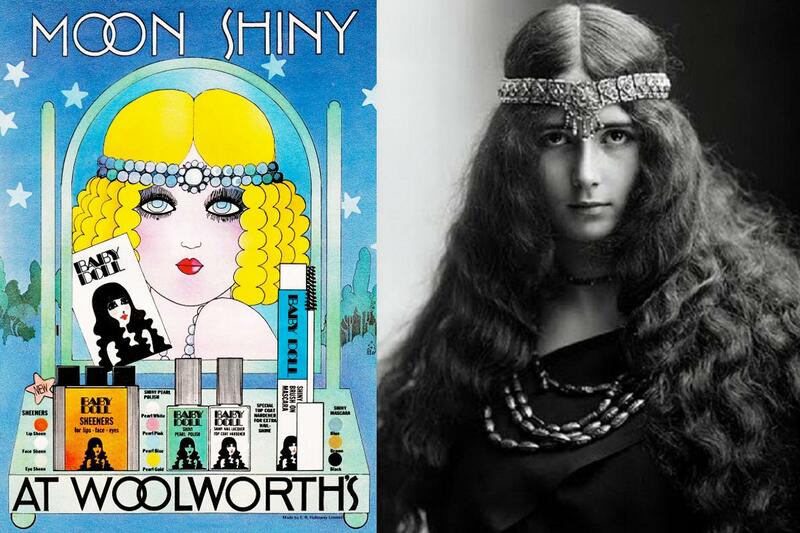 Influence of Art Nouveau, Pre-Raphaelites and Edwardian era can be seen not only in visual arts but also in fashion and film costumes. In 1990s there was a Jane Austen revival with films such as Sense and Sensibility. 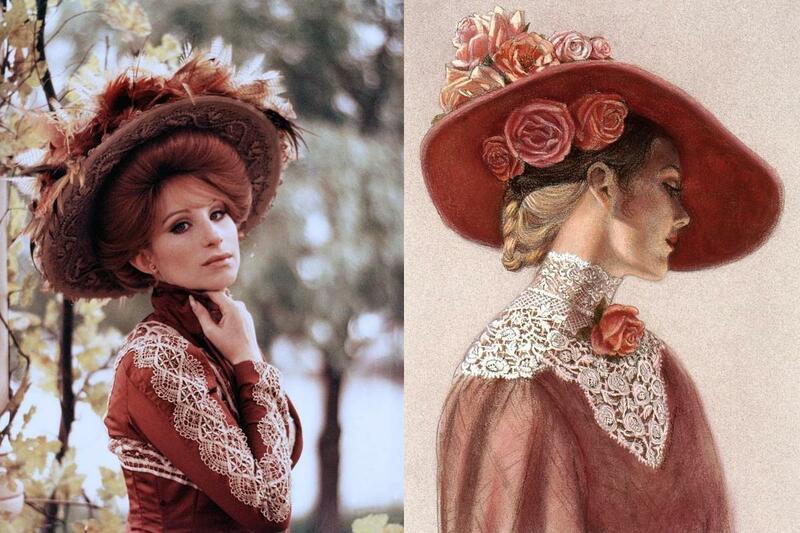 Well, films from the sixties and seventies are all about turn of the century; large hats decorated with roses, Art Nouveau interiors, Edwardian dresses in pastel colours with abundance of ruffles and lace… Some great examples of this aesthetic are films Hello, Dolly (1969) with Barbra Streisand, La Ronde (1964), Morgiana (1972), Viva Maria (1965) with Brigitte Bardot and Jeanne Moreau, Baba Yaga (1973) etc. It’s that time of the year again, when sweet Autumn rains and whimsical winds bring thoughts of Romanticism and Echo and the Bunnymen to my mind. Gloomy, post-punk and a bit psychedelic melodies of Echo and the Bunnymen’s album Heaven Up Here (1981) resonate perfectly with moods of Caspar David Friedrich’s paintings. Dreamy and gloomy paintings of Caspar David Friedrich go hand in hand with brooding post-punk melodies of Echo and the Bunnymen’s album Heaven Up Here; this artistic match made in heaven delights me beyond belief, often to the point of tears – tears of beauty. Similar mood pervades Friedrich’s painting Greifswald Harbour and song Turquoise Days; moody melody coming from the distance, from a rocky beach somewhere in Wales, emerging from an ancient Albion mist, coming from the distant Celtic shore… Similar dreamy, yet sombre mood can be found in all of Friedrich’s artworks, specially those portraying a beach or a harbour, where ships appear from the blueish mist, like in a dream. In ‘Greifswald Harbour’ Friedrich revisits the landscape of his childhood, portraying the harbour of Greifswald; a seaport on the Baltic coast and his birth town. Cold climate and death of close relatives intensified his tendency towards melancholy, his sensitivity and perhaps even a certain sense of isolation that dominates his paintings. Take a look at the painting. I’ll give you a moment to sober up from the beauty of those dusky colours and mystic shades of blue, green, grey and yellow. Greifswald Harbour was painted between 1818 and 1820, in times when Romantic sensibilities were slowly becoming ‘passé‘, and Friedrich was perceived not as a symbol of a generation and a romantic hero, but as an overly melancholic recluse who spend most of his time alone, wandering woods and meadows, and enjoying the isolation. He said himself: “I am not so weak as to submit to the demands of the age when they go against my convictions. I spin a cocoon around myself; let others do the same. I shall leave it to time to show what will come of it: a brilliant butterfly or maggot.” It goes without saying that the fruit of his life, his oeuvre, is indeed ‘a brilliant butterfly’. Aesthetically, this is a typical painting of Romanticism. Symbolically, it deals with subjects of transience and painters own mortality. 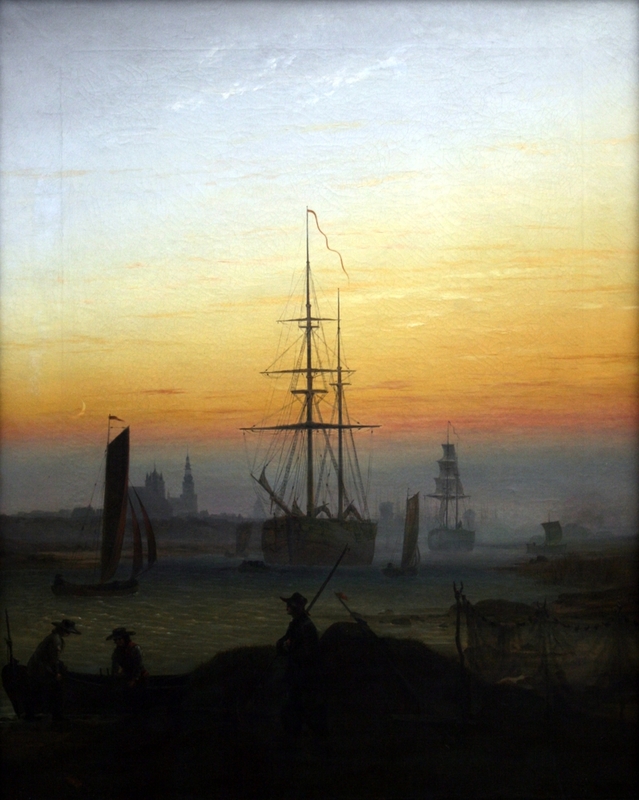 In the dusk, small and large ships appear through a misty veil of Autumn evening. Glimpses of cityscape appear through the grey blueish fog. Shy waning moon shines in the sky. Day is dying in rich warm yellow and orange shades, while fishermen in the foreground are nearing the end of the working day, probably in a hurry to visit an inn or a brothel. Ah, the mood of harbours, with sailors and hookers, goods from the far East, constant change and movement… Friedrich’s harbour is a somewhat desolate place. Those large ships are probably returning from a long trip, or just setting off to a new voyage, but what about the smaller ones? Some ships probably never left the harbour, nothing exciting comes on their path. They could spent a whole existence soaking in the cold sea water waiting for something which never really occurs. It’s like an unlived life. Once again, Friedrich stimulates the viewer to observe the deeper, psychological side of his art. I would like to finish this post with beautiful lyrics written by Ian McCulloch of Echo and the Bunnymen. Dear reader, set sail in the beautiful turquoise days and crimson nights of Autumn that are upon us. I’m a psychedelic schoolgirl with passion for art, music and literature. I don't own ANY of the photos/paintings on this blog, unless stated otherwise. If you see your photo here, contact me and I will remove it. This work is licensed under a Creative Commons Attribution 4.0 International License. © Byron's Muse, 2013-2018. Unauthorized use and/or duplication of this material without express and written permission from this site’s author and/or owner is strictly prohibited. Excerpts and links may be used, provided that full and clear credit is given to Byron's Muse with appropriate and specific direction to the original content.